Use TB4FE6K to reference this item. 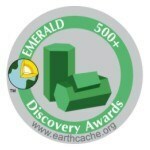 You are allowed to discover this tag, when you visited at the least of 500 Earthcaches, or at the least of 7 of mine Earthcaches. In the log, please tell, which requirement you fulfill.